This kit is an essential for any student, hobbyist or amateur engineer. Choose from sine, square or triangle waveforms at frequencies from 2 Hz all the way up to 1MHz*. True adjustable AC output great for injecting signals for troubleshooting radio and audio electronics. Four selectable ranges allow the user to accurately dial in just the right frequency. 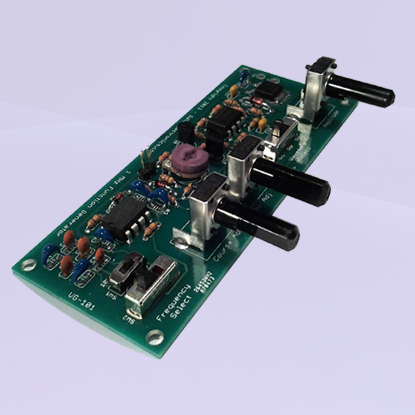 The unassembled kit includes instructions (including schematic and parts placement) and all the components to build one complete 1MHz Function Generator. A soldering iron, solder and a pair of cutters are required for assembly. User selectable frequency from 2 Hz to 1 MHz* with 4 frequency ranges and coarse and fine adjustment controls. Square wave, sine wave and triangle wave selectable via three position slide switch. Operates from a single +12V supply thanks to onboard ±5V regulated supplies. Adjustable amplitude from ±0.5V to ±3V with separate logic output** for external triggering or clocking. Wide input supply voltage from 12VDC to 30VDC and a maximum supply current of only 25mA. Op-amps can be substituted for improved waveform quality. Outputs guaranteed up to 500 kHz. **Additional TTL logic buffering recommended for proper waveform shaping and clocking.